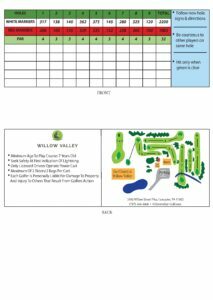 Willow Valley Golf Course will once again be a 9 hole course! It will be a par 32 – 2200 yard course. The construction is complete and the Chapel is in a beautiful location to help enhance the Golf Course property. 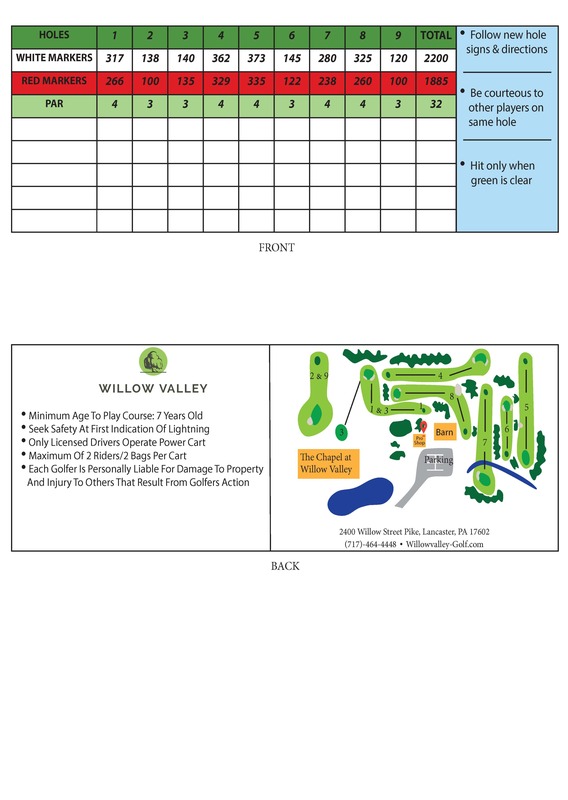 For 2019, we will be working on rerouting of the holes to create a 9 hole layout. There will be 2 green complexes that will be used as the greens for holes from different tee boxes. 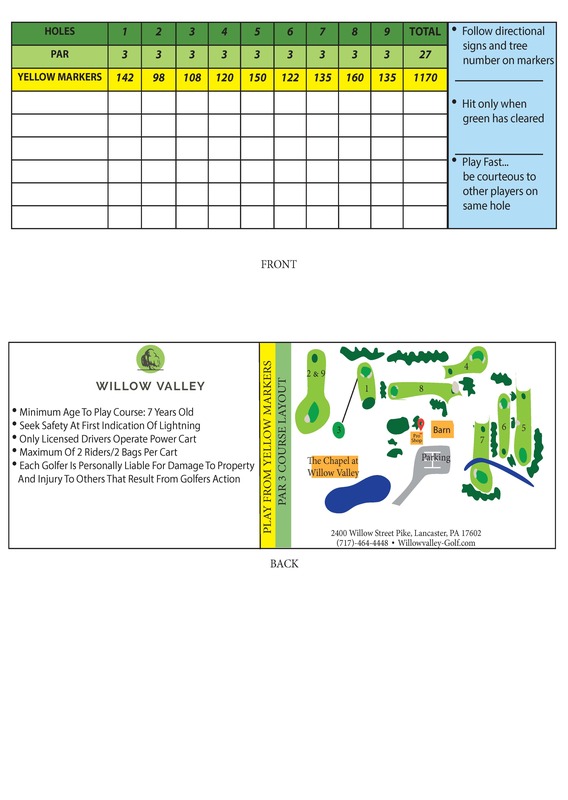 The rerouting of the course will be new to all players as the original holes will change numbers to create a flow across the course to try to avoid congestion on the holes using the same green twice. 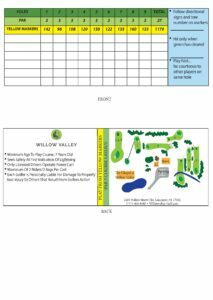 Players will be provided the new flow of the holes and are expected to be courteous to other players on the holes where new tees and greens are used. Also new for 2019 will be a Par 3 layout. There will be a new and unique Par 3 layout on the existing course as a second option. The existing Foot Golf course will be closed and replaced with the new Par 3, 9 hole layout. This new course will have some new tee boxes to create a par 27 – 1100 yard course. The course will have some challenge to it and will be an excellent choice to practice your iron game, take a beginner golfer out to experience the game, and for a family to have some fun. If you require Rental equipment to play we offer two choices to use: a basic set of clubs and bag for $10 fee. We will still have our Honor system in place for those who wish to take the evening walk while playing. After 5 Pm we shall have the $10 unlimited walking rate. Memberships: We offer special play memberships that are good for the calendar year of 2018. The categories are: UNLIMITED WALKING: $700 for the calendar year of 2019. RIDING MEMBERSHIP: $1300 for the calendar year of 2019. 18 holes max per day All memberships are subject to course conditions. We will have some great deals on high quality FootJoy shoes. We will carry nice high tech fabric shirts with our new logo. We will have for sale some great licensed logo hats of your favorite college and pro teams, as well as Titleist low profile tour hats. We have fantastic deals on used clubs with a great selection and prices you can afford to get a new high tech club. Our PGA professional Mike Versuk offers short game improvement lessons. Contact him for scheduled times at 717-464-4448 and prices to fit your budget. In addition he offers club repair at very competitive prices. Get those new grips on at the start of the season and have a great connection with the club. © 2019 Willow Valley. All Rights Reserved. Website by Infantree.